Isn't it funny how you can be going about your everyday life, thinking nothing in particular, when, suddenly, you meet someone who has the power to change your way of thinking, or even the course of your life, just by being themselves. I suppose that's what makes us human in some ways, our ability to be influenced and challenged by those around us. I came across a really lovely young lady on Facebook today. She's the niece of a good friend of mine, and she told me the most wonderfully inspiring story of her brave battle with Leukaemia. What amazed me, was that the story was never about her illness, or her fear, or even her, often death-defying, road to recovery. It was a tale of positivity, survival and selfbelief. The guest post that follows is Shannon Humphrey's story, in her own words. Right I have never done this before so here goes, I am a 17 year old girl soon to be 18. In 2008 I was diagnosed with Acute Lymphoblastic Leukeamia. Im not going to go on too much about myself because I don't want sympathy or for people to feel sorry for me, I want people to read my story, be inspired and so I can help people in the situation I was in four years ago. I will post my full story but it's up to you whether or not you want to take your time to read it :).. When I was 12 years old I began to lose alot of weight. I began to get severe headaches, began to feel very tired, weak and constantly sick (if not physically).... My mum, Debbie Humphrey, became very worried and booked me into the first possible doctor's appointment. After doing blood tests they told me I had very bad Glandular Fever and sent us home with antibiotics. Day by day I became worse and worse and mum was not happy with the diagnosis the doctors had first issued us with. She took me back and told them "Shannon just isn't getting better and she has found large tennis ball sized lumps in her breasts". The doctors agreed that they weren't happy with my progress, the weight was still dropping off me and the headaches became black outs. They referred me to a breast specialist at the age of 13 just after my birthday, but the appointment was a further three months away. Weeks went by and I began to struggle getting out of bed and moving around, once again for the final time after probably 4/5 months of suffering with what we was told was Glandular Fever, we headed back to the GP. They did more blood tests and finally said "We can't be sure, but we think Shannon has Leukaemia. We're going to send her over to William Harvey Hospital for more tests" Mum was devasted and didn't want to admit what was happening but I had told her "Prepare, mum. I know I'm not well, really not well." We arrived at the hospital and the docs there said "We think its just the off sets of the Glandular Fever" So mum was some what more relieved than the hours before. I woke in the morning to find 6 doctors surrounding my bed, This was bad news for sure. They took mum away from me and took her and my sister Sacha Humphrey into a seperate room they confirmed then that the diagnosis was 'Actue Lymphoblastic Leukamia' the first thing my sister asked was "Is she going to die?" they told her they couldn't be sure what was going to happen as they didn't know how far gone the Cancer was. My family were broken, My mum and Dad's little girl was seriously ill, My sisters and brother's little sister was unsure whether she would survive or go to heaven. Everyone except me were devasted ( I knew what was coming). Within hours I was taken up to University College London Hospital by ambulance, My family waved me and mum off as they was trying so hard to be strong for me and hold back their tears. The next few days were just full of tests and scans and the dreaded 'Chemotherapy'. The days went by and life in the hospital just became like a so-called second home, Mum wouldnt stop crying to be honest she was annoying me a bit and one day I woke up and said "Mum thats enough now, your doing my head in. The crying has to stop im going to be fine, please smile". My consultant told us I would become more poorly before I got better and he as true to his word. 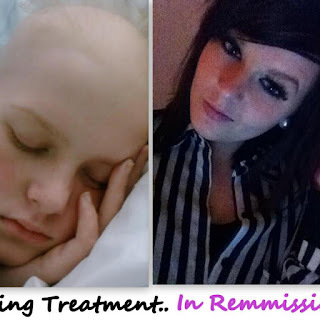 The chemo made me sick, tired and generally unwell and my hair began to fall out. This devastated me, a teenage girl with no hair? this was the only thing that I got worked up over. Just weeks into the treatment I got severe stomach and back pains and I was in agony. They told me after tests, I had Pancreatitis. This left me an insulin-dependant diabetic and i still inject to this day.. Months in to my treatment they came in with another chemo. This one was an injection called 'PEG Asparaginase' into my leg. It had some bad side effects to it, but it was part of the process to make me better. The next day mum woke me to take my tablets & I rolled over and said "just another 5 mins, mum". By the time I shut my eyes I began to fit. Mum hit the emergency button and everything was thrown out of the room ( so I am told). I had had a bleed to the brain and was rushed to intensive care where I didn't wake for 3/4 days. When I woke I couldn't talk; I just made a loud high pitched noise. Mum feared that the bleed had caused brain damage. After a week or so I was taken back up to the ward. I was very weak and had to have physio to teach me slowly how to walk again. The months went on and I was allowed home, having a wonderful Community Nurse team coming round to check how I was and give me chemo through my 'Portacath'. This was a small device place just above my breast underneath the skin, which they accessed with a small needle. Although I was still having chemo, things seemed to be looking up. I was having friends round to visit and everyone began to smile and laugh again for a little while. Until December 2010 My sister in law Raeanne Geary was looking after me and called my mum at work stating "Shannon's Blue!" Blue?! Mum thought to herself (We have to tell you that our Rae is a little bit dipsy at times, so mum did question it, haha!) Mum thought she had better come home and check..
To cut a long story short; I was once again rushed to London in an amblance and they told my mum they wasn't sure I was going to make the journey :/ Luckily, I did, but I was struggling to breathe. I got transferred to Great Ormond Street Heart Intensive Care where they confirmed I had a huge blood clot in my heart chamber. Again; not good news for my family. They told my mum she had to make a decision; they either cracked my chest and performed open heart surgery, or they give me a strong medicine with terrible side affects such as death, brain damage and many more. The catch to this medicine is that they are only meant to give it once, so if it doesn't work then they had no choice but to perform the surgery anyway. It was a hard decision for mum to make but she decided the medicine was the best bet. As feared, it didnt disperse the clots. My family had all come up to support me but really was told to say goodbye. The consultants discussed what was to happen next. They had never done this in anyone of my age before but they decided to give the medicine again. Luckily, it worked the doctors called me 'The Miracle Child' and I was asked to sign something to say I was the only child of my age that had survived this procedure and for it to be noted in a medical file. I arrived home just before Christmas on Christmas Eve. Lucky so I could spend time with my family and try and forget about the horrible things that had happened. I continued on chemo at home continueing to go in and out of William Harvey Hospital for blood transfusions, platelets, i.v antibiotics. I was counting down the days now till my last day of treatment!! 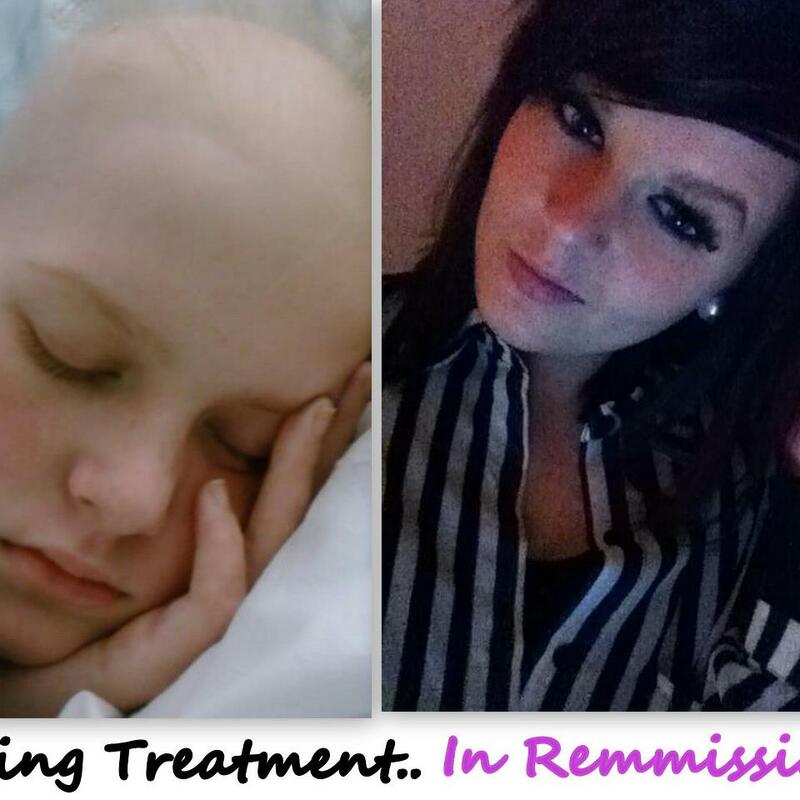 Finally in December 2011 I was told I was in Remission, I had had my final dose of chemo and I was ready to start becoming 'Normal' again, My family, myself and my only few friends that had stuck by me were delighted. It was mad to think, after everything, I was still here and I was free of the nasty chemo; no more hair loss and I could start to be the cheeky Shannon everyone use to know again. Thats my story summed up into as little as I possibly could, Now me & My family would like to help other families going through this horrible illness!! Now the reason I want this told and the reason I am posting this is because I have recently set up a facebook page I want to help people with the 'BIG C' or families of sufferers. Are you the one with the 'Big C'? Are you the mum or dad of a child that has been diagnosed and need questions answered or advice? Are you the siblings of a poorly younger brother or sister? or even a sibling of an older brother or sister? Whoever you are, whatever questions and support YOU need we are here for YOU!! Please please please Like & support my Facebook page so I can support sufferers! ThankYou For Reading my case! Lets Help More People Like Myself & Thousands Of Others Out There!! Thank you, it was the least I could do when I heard her story. I think it's high time I stopped moaning about the odd headache! Such an inspiration and I'm sure Shannon will go very far in life with her positivity and her want to help others. I believe Shannon survived for a reason, to go on and inspire others. Thank you for sharing your story.